​I'm a convert to light loads in clay cartridges. In my over/under Browning I shoot 21g fibre cartridges wherever possible. I shoot better with them then I ever did with heavier loads, they're cheaper and the fibre wads mean I don't have to brush melted plastic residues out of my barrels. My cartridge of choice these days are 21g Hull Comp-X simply because these are what my local gun-shop stocks. I'm luck that my semi auto will also cycle 21g loads, but it prefers a plastic wad to do so reliably. I tend to use 21g Trust cartridges for this as they're stocked in a couple of shops locally. They also have the added benefit of being the cheapest cartridges on the shelf! ​More so than with target loads, you will need to choose cartridges suitable for the quarry and shooting conditions. My one piece of advise would be to spend a little more on decent cartridges if you want to go after live game. I personally use RC Champoin (30g #6) in both my over under and semi-auto. It is a cracking cartridge which kills cleanly. As with clay cartridges I only use fibre wads with lead shot game cartridges. This is especially important if shooting on or near land used for keeping livestock, as ingested plastic wads can quickly lead to heavy vets bills! When it comes to non-toxic loads I started off using Eley Bismuth. 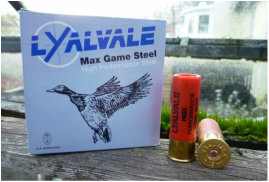 These days however I have a steel-shot proofed semi-auto and shoot exclusively Lyalvale Max Game Steel (36g #3). The recoil isn't as fierce as you might expect. The only downside to steel shot is the necessary use of plastic wads. I've always been very careful about using lead shot legally. There's never an excuse not to. Please make sure you understand when and where it is mandatory to use non-toxic shot as it varies across the UK.